A toy box that will be treasured as much as the treasures it holds. 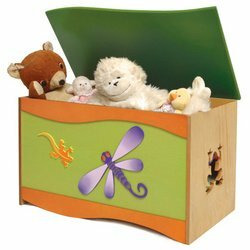 Frogs and snakes accent this toy box, made of solid birch and finished in colorful stains. Measures 32"W x 18"W x 17"H. Weighs 62 lbs. If you have any questions about this product by Room Magic, contact us by completing and submitting the form below. If you are looking for a specif part number, please include it with your message.